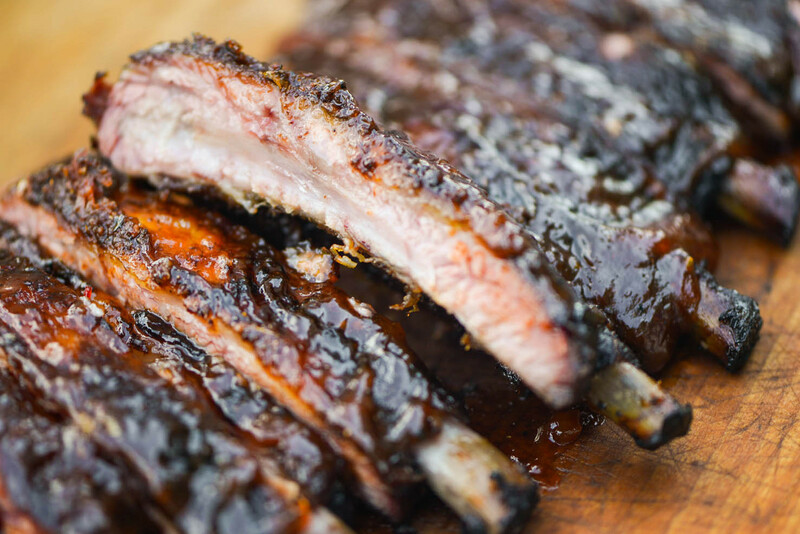 The easiest way to prepare ribs at home! In a stockpot, bring the 6 quarts of water to a boil. Stir in 1 cup each sugar and coarse salt until dissolved. Add the smashed, unpeeled cloves and the ribs. Boil until cooked through and tender at the bone, about 30 minutes. Transfer meat to a wire rack and let stand to dry, 5 minutes. Heat grill for direct-heat cooking or heat oven to 425. Brush meat with olive oil and season generously with coarse salt and freshly ground pepper. If you have a dry rub or seasoning that you love, you can sprinkle some of that on, too. Grill the meat or cook in the oven, turning a few times, until charred in spots, 5-10 minutes. If the oven doesn't achieve the desired char, you can broil for a few minutes, as well. Brush with barbecue sauce in the last few minutes of cooking. Slice pork ribs to serve. Serve alongside cornbread, if desired, and cabbage slaw.